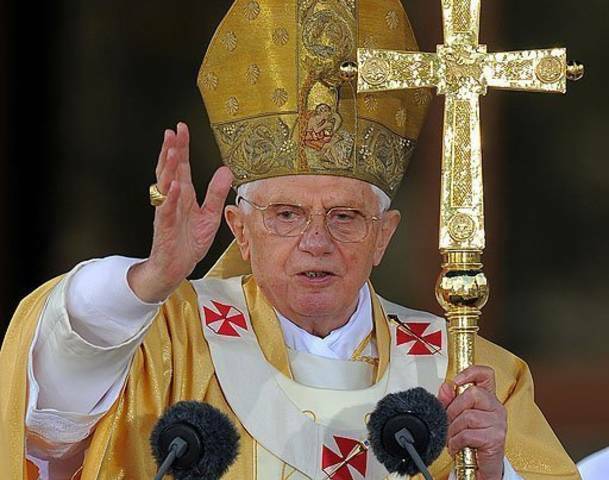 Cross and Cutlass: Is the next pope of the Catholic church the last one? Is the next pope of the Catholic church the last one? An unheard of even happened a few weeks ago. Pope Benedict XVI resigned. It was the first time in history that death has not removed a pope from the Catholic Church. I found this very interesting. Especially in light of a prophecy given over 800 years ago by Saint Malacy. Though I'm not sure I believe all of this, I thought you might find it interesting! Saint Malachy was known as great prophet. During his life he received a vision showing him all the Popes from his day to the end of time. Malachy assigned short descriptions in Latin to each pope when he committed his vision to paper. These mottoes usually refer to a family name, birthplace, coat-of-arms, or office held before election to the papacy. Some of the phrases are multiple prophecies, written with ingenious word play. Normally, I wouldn't believe this type of thing, though I do very much believe in the gift of prophesy. However, the Bible tells us that we can spot a true prophet if his prophecies come true. And amazingly through the centuries, St. Malachy's papal prophecies have! With St. Benedict's recent resignation, we have only one more pope to come. Peter the Roman. Very interesting stuff! Time will tell. Wow, this is just totally interesting !!! And pretty amazing too. Guess we'll all just have to wait to see how this final Pope's story is played out. Actually, three popes besides Benedict XVI have voluntarily resigned as pope - Saint Clement I in the First Century, Celestine V in 1294 and Gregory XII in 1415. There's an awesome Catholic website that sheds a bit more light on the correct/incorrect details of the prophecy. The majority of the Catholic church dismisses this as just a forgery due to when it was found compared to the number of correct details of popes (found in 16th century, majority of correct details are on pre-17th century popes, after the 16th century, they become very vague). Very interesting topic though! Really makes one wonder. And hopefully my link below works... it really is intriguing to read and research. I don’t dwell on any of the end times prophecy stuff. It is always interesting to read though! We are told to always be ready for the return of Christ. It could be tomorrow or it could not be for 1000’s of years. Only God knows! Very interesting. We talked about this in church last Saturday.